In December there are basically two types of events: Those related to Christmas and those which are not. There are (too) many of the first type, and you can find a list of them here. If however, you're tired of all the Christmas-themed events and would like something different for a change, then this article is for you. It's a bit thinner than usual, but that's to be expected as quite a lot of efforts are taken up by the Big C.
Perhaps it's a good idea to alternate between Christmas and non-Christmas events this month, or else the kids will be tired of Santa before the big day itself arrives. With that intent in mind, this calendar includes both the Christmas and non-Christmas events in different font colour (red for Christmas and black for non-Christmas events). 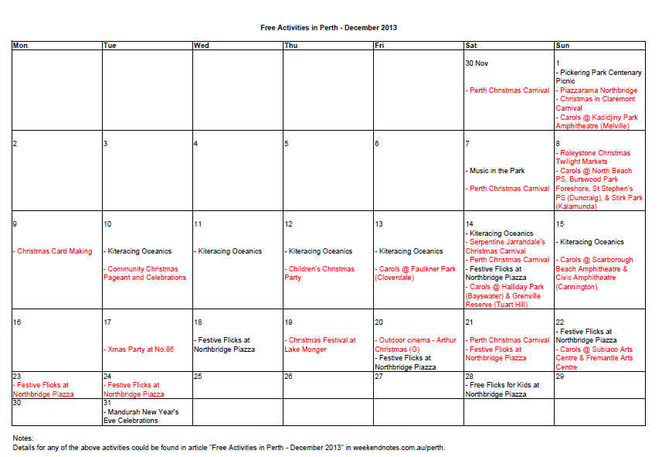 The non-Christmas events are detailed below the calendar; and as mentioned before, you could find more information about the Christmas events in this article. Town of Bassendean is celebrating Pickering Park's centenary by holding a Gala Day with a vintage theme. There will be vintage games (sack races, tug-o-war, quoits, etc), refreshments (ice pops, fairy floss, popcorns), and cars and bikes (those which were actually on the road 100 years ago). To match the surrounding, why not wear your Sunday best of vintage clothing. If you have any waistcoat, bonnet, parasol, ... this is a chance to air them. Thank goodness for music that's not carols. In the second event of this series, Kim Churchill, an Aussie-born musician who's gone international will take turn with local WA artists Polly Medlen Band and Tash Shanks to entertain us with their own brand of music. I hope listing this event here does not scare you off. 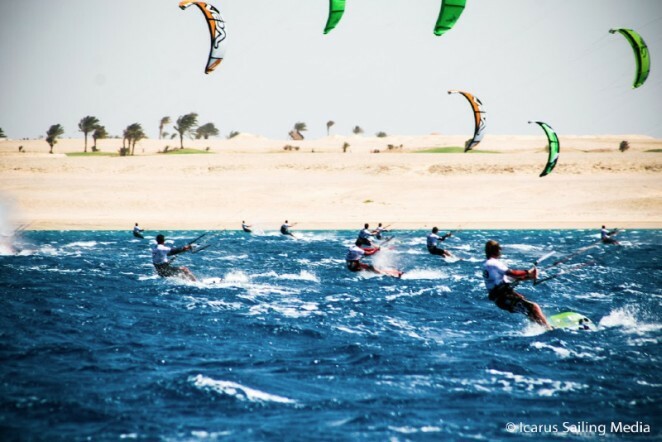 No, I'm not about to say that all of use should start willy-nilly joining the kiteracers. But it would be fun to enjoy the weekend at the beach while watching all these colourful and exciting kiteracers having a go. Moreover, the organiser realises that you can't spend whole days just watching this sports, no matter how attractive it is. So they thoughtfully add even more entertainment for families including food & beverage stalls/ outlets (from Fri 4pm), twilight movies (Fri 7pm, screening a movie about surfing "One Touch"), family entertainment (from Sat 11am), live music performances (from Sat), and other beach sports displays including Surf Life Saving, Beach Cricket & Beach Volleyball (from Sat). Where: Northbridge Piazza, cnr Lake & James Sts. Ever since I was a kid, I always thought New Year is best celebrated with fireworks, and I still think the same now. For family-friendly fireworks timing, the best location to head for on New Year's Eve would be Mandurah Foreshore. They have not one but two fireworks planned: 9pm to cater for the young ones who could not hold their eyelids open beyond 9pm, and the proper midnight one to usher in 2014. Before that, the community celebration will be in full swing, with the foreshore choc-a-block with families, kids, youth, and all. There will be road closure in the area from 5pm onwards, but traffic attendants will be there if ever you get confused in approaching the location. Why? Free entertainment for the family.